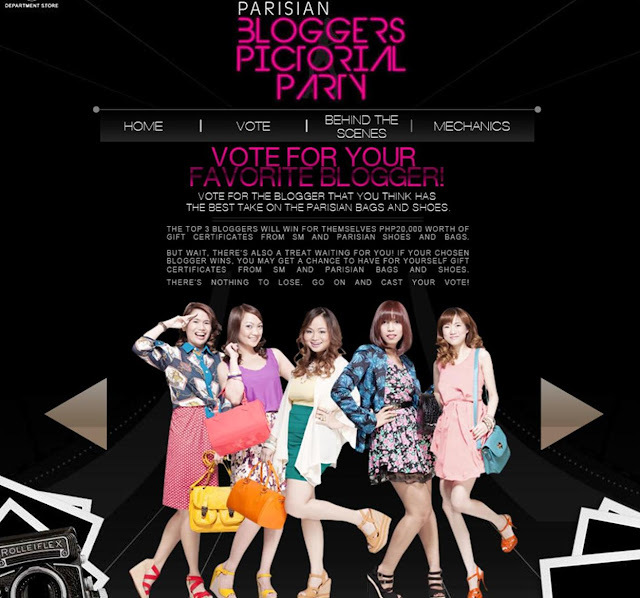 Want to win P20k SM Parisian GCs? Now the photos with my fellow bloggers are out in their Facebook page! Everyone looks great! Step 3 – Click on the thumbnail of the girl na naka scarf print top and red polka skirt and naka saludo! ;P Lol. Step 7 – Comment with your Name, Email, and Twitter Username below! :) If you voted thrice, and daily, keep on commenting below para more chances of winning! You can vote up to THREE times per day! :) Sulitin! Haha! Thank you guys! :) Leaving you with a funny, blooper, parang-high-lang photo from the shoot, hahahaha! Thank you in advance and do support the other bloggers as well, mwah! Thank you so much Margaret! :) For your time and support!!! :) THank youuuu! Karl nakakatouch!!! :) Super maraming salamat!!!!! ALL COMMENTS POSTED BEFORE THE EDIT ARE CONSIDERED ENTRIES NA! :) THANK YOU! voted 3x today :) good luck! voted for you 3 times!! my vote marathon for you starts today! just voted you Ms. Ana!! I voted for you again today! Good luck! i will vote you! Good Luck..
i voted you 3x a day,im sure you win!! I voted three times today!